In medical literature there are thousands of books. Few days back one our member on Facebook asked us about this book. To be honest we were unfamiliar with this at that time. We provide links of BOARDS & WARDS to that member and download it. After reading this book we came to know that we are ignorant because this is master-piece for quick review of Medicine, Surgery, Peripatetics, Gynae & Obs, Psychiatry. Kpalan Medical Series had published a book "Mater the Boards Step 3" (Links are given in other post) but this one is much more easier. 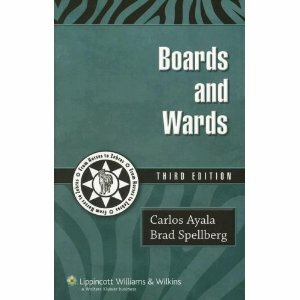 Boards and Wards is just 180 pages books. You have to read text books first then relax and turn this short, concise and to-the point book. We repeat again that once you studied your books for respective subjects then consult Boards and Wards. We are thankful to our member for giving such a good book info.